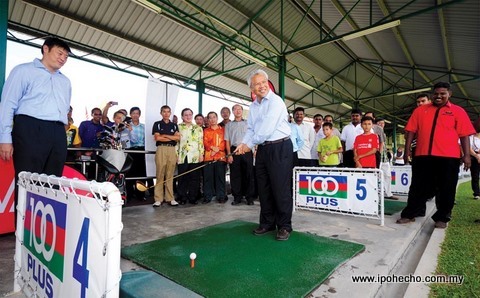 Another important milestone for Kinta Properties was reached when The Centro, a community recreation centre in Bandar Baru Sri Klebang was officially launched by the Second Minister of Finance, Dato’ Seri Ahmad Husni Hanadzlah. Kinta Properties’ Chairman, Dato’ Lim Si Boon, in his opening speech, said that the vision for Bandar Baru Sri Klebang consists of the three elements of LIVE, LEARN & PLAY within the community. With the different types of affordable and luxurious homes, commercial centres and shops already being occupied and fulfilling the LIVE element, The Centro, fulfils the PLAY element providing a place for residents to gather with family and friends. Its facilities include a golf driving range, 25m swimming pool, children’s wading pool, gymnasium, play area, as well as cafeteria. The Centro hopes to promote healthy lifestyles and foster closer family interaction. As for the LEARN element, the Poi Lam School building is presently under construction and shall be ready for operations in Sri Klebang in 2012. Another school, a Sekolah Kebangsaan, also under construction, is expected to begin operations soon. Jalan Sri Klebang 2, Bandar Baru Sri Klebang, 31200 Ipoh. Tel. : 05 293 1328/1333 or email: info@thecentro.com.my. Kinta Properties recently commenced handing over the remaining 26 keys to home-owners in the South Precinct of Parklane Residences, a gated and guarded community in Ipoh comprising a total of 62 homes located in the 650-acre Bandar Baru Sri Klebang. The handover marks another great milestone in the development of Bandar Baru Sri Klebang with more than 1,400 residents making the community their home to date. The handover ceremony took place recently during Kinta Properties’ ‘Meet the Residents’ evening held at their 20-bay golf driving range in Sri Klebang. The developer took to the opportunity to brief residents on developments to the community such as the use of CCTVs along the community’s perimeter fencing. Bernard Tan, Group CEO, Kinta Properties, briefed residents about the expansion of the community’s Clubhouse facilities, which will incorporate a 25-metre swimming pool, a gymnasium, a restaurant, and play areas for children. These will be ready for residents’ use by December 2010. With nearly 100% of the South Precinct sold, Kinta Properties is now gearing up for the launch of the Northern Precinct at Parklane Residences with 1 and 2 storey detached homes and Semi-Ds in the master-plan. Bandar Baru Sri Klebang is a freehold, 650-acre mixed township development which incorporates detached homes, semi-detached homes, link homes and shop lots amidst lush gardens and landscaped parks. Sitting on a former rubber estate plantation, Sri Klebang is expected to have a total population of 35,000 residents upon completion in 8-10 years’ time. 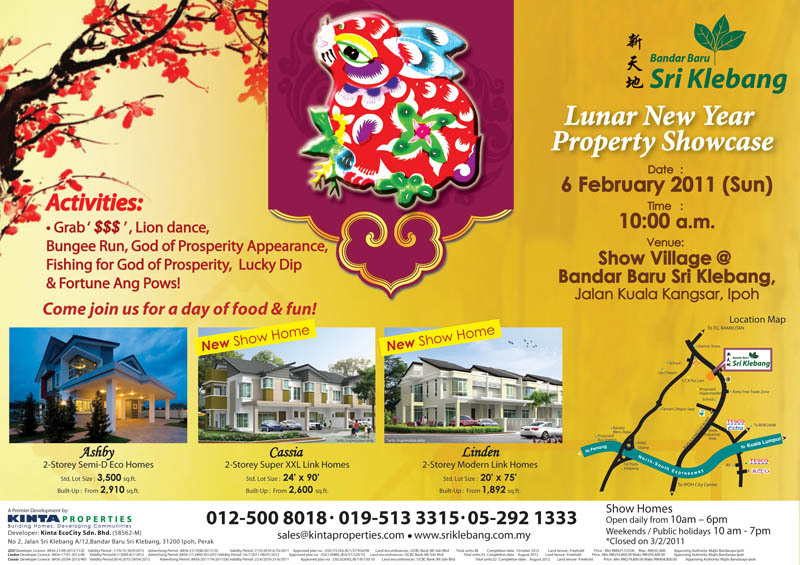 The show homes at Bandar Baru Sri Klebang are open daily from 10 a.m. – 6 p.m. on weekdays and 10 a.m. – 7 p.m. on weekends. 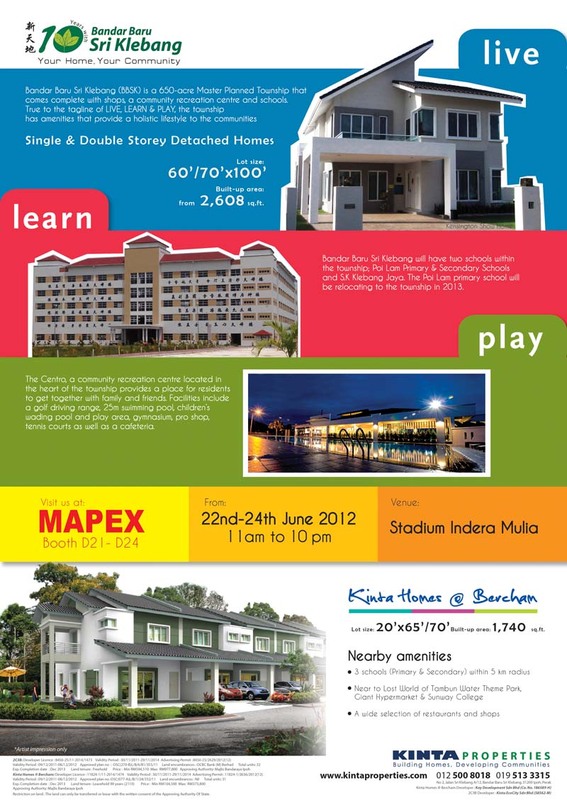 For further information, call 012-500 8018 or 019-513 3315, or visit their website at www.sriklebang.com.my.